- Ideal for Men & Boys.The buckle design & colour may vary. 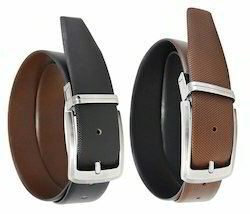 - Reversible belt : one side black, one side brown.Made in Real Leather.Suitable for casual use with pants, denims, chinos etc. - Suitable for casual & Formal use.A belt that men would love to have. Description : We offer an exclusive collection of leather belts. These belts perfectly compliment your stuffs that you are wearing to an occasion. Available in various colors and designs, these are very cost effective. We are affianced in offering the finest quality range of Reversible Pin Buckle Black Belt. Our exclusive range of belts are a must have fashion accessories that compliments well with every attire. These belts combine the essential aspects of both beauty and utility.